June ended up seeing warmer than normal conditions across much of the country, providing the warm start to summer we expected. A key exception was the South and Southeast, where temperatures were a bit cooler than normal and precipitation ended up well above normal. This provided much needed drought relief to that part of the country. 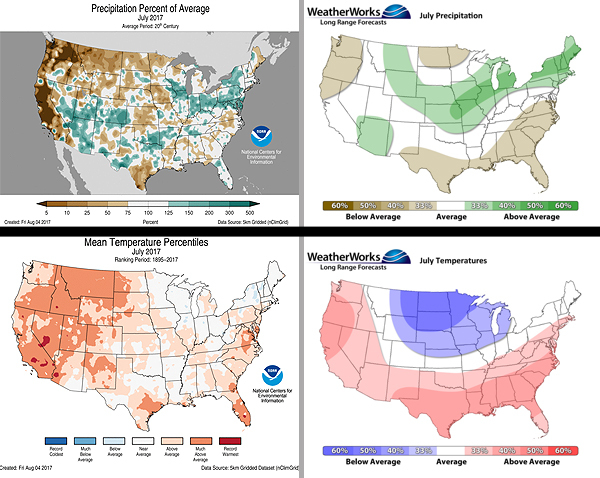 Parts of the Great Lakes, Upstate New York and interior New England saw above normal precipitation in June, part of an active corridor of weather that was anticipated to setup from the Midwest towards the Northeast, though parts of the Midwest were a bit drier than hoped. Much of the west was very warm in June and fairly dry, a trend that would continue through the summer. July 2017 comparison to the summer forecast above. Actuals (via NCDC) on the left, forecasts on the right. July also featured the bulk of the nation falling on the plus side of normal in the temperature department. Parts of the Midwest, Great Lakes, and New England did come in on the cool side due to backdoor cold fronts bringing in cooler air from the Canadian Maritimes into those areas. The cooler weather was focused farther east, but an active storm track from the Midwest to the Northeast along this temperature gradient did take shape as forecast, especially around the I-80 and I-70 corridors. 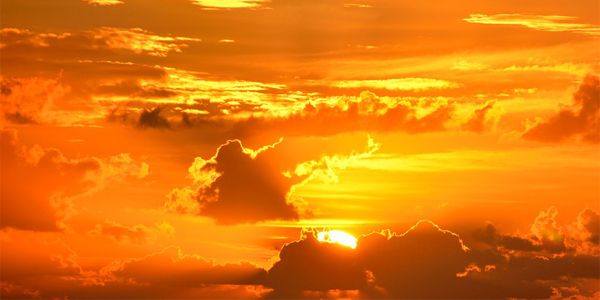 Much of the west continued to stay very warm, though a more active than normal monsoon brought well anticipated relief from the heat and above average rainfall to the Desert Southwest. After a beneficially wet June, much of the Deep South and Southeast turned drier in July as was forecast. August was and still is expected to be the coolest month of the summer, compared to average, across much of the central and eastern United States, and early indications are that the first half of August will be below normal for almost everyone east of the Rockies. Temperatures may moderate some after mid-month, so we’ll see where the final monthly departure ends up, but a cooler month would be welcomed by many as it helps to keep electric bills down and makes it more comfortable as the kids head back to school. The West may be the region that escapes the bulk of the cooler, more pleasant weather over the next few weeks.